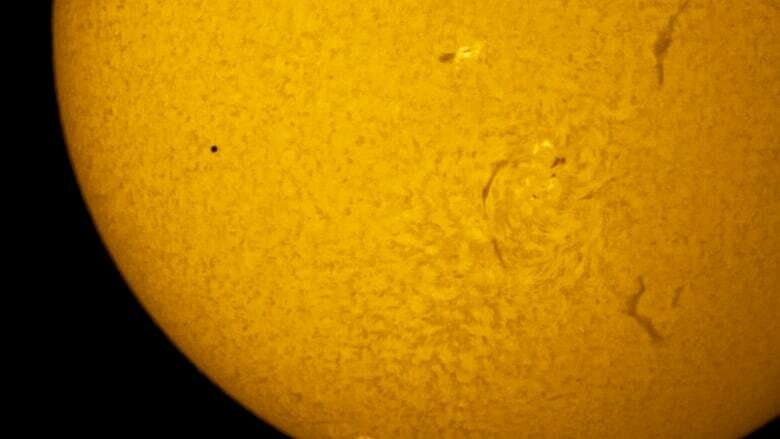 Canadians got a rare view of Mercury as it crossed in front of the sun today. Event takes place between 7:12 a.m. ET and 2:42 p.m.
Mercury began making its way across the face of the sun at 7:12 a.m. ET and completed its crossing at 2:42 p.m. ET, moving from east to west. It's not safe to view such an event without proper solar filters, but solar-filter telescopes were available at public observation events held across the country by astronomy clubs, observatories and universities. Mercury is so small that astronomers said it was unlikely to be visible without binoculars or a telescope (equipped with solar filters, of course). For those who couldn't make it to one of those events, NASA was streaming a variety of coverage that included a panel discussion with NASA experts about the event, along with live images from the Solar Dyanmics Observatory satellite. The event was also being streamed online starting 7 a.m. ET by Slooh, an organization that broadcasts celestial events online from telescopes around the world. Transits of Mercury happen only about 13 times a century — the last was in 2006 — and Canada isn't always as well-placed to see the entire event as it is this time. The next will be in 2019, but after that, there won't be another daytime Mercury transit viewable from Canada until 2049. Not only are Mercury transits rare, but they're also some of the best opportunities to see the closest planet to the sun. Typically, it's tricky to observe even at night, because it's only ever visible near the horizon close to dawn or dusk, and you need to know where to look. Mercury orbits the sun every 88 days, but isn't visible every time it passes between the Earth and the sun because Earth's and Mercury's orbits are tilted relative to each other. That means Mercury often appears above or below the sun when viewed from Earth. Slooh webcast of transit of Mercury, starting 7 a.m.